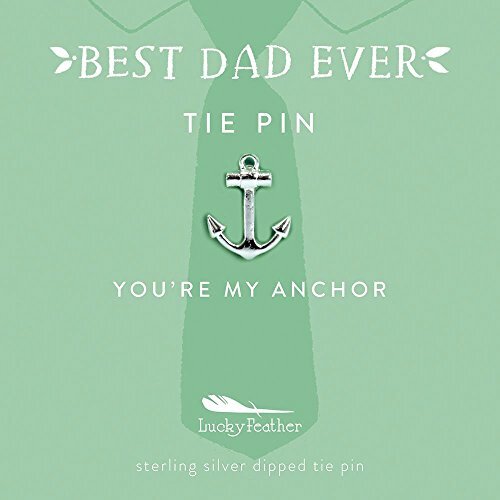 Lucky Feather BEST DAD EVER” Father's Day Gift tie pin, Anchor Tie Pin Sterling silver dipped Mint Green Card: “You're My Anchor” | What Should I Say? Fathers are so hard to buy for Yet, they deserve the very best. Lucky Feather's Anchor tie pin is the perfect way to let Dad know how much he means to you in every way. You can let him know that he is your rock, your foundation, your anchor. How can you say it any better? This handsome, sterling silver dipped ANCHOR tie pin is great on ties, hats, lapels, anything dad wants to wear it on. "You're my Anchor". He's going to love it. A gift for dad should always come front the heart. He wouldn't want you to spend too much, and he doesn't need anything. Right? That's what makes the Lucky Feather Anchor tie pin such a perfect gift. So, for all those nights he came home late from work, for all those times he drove you to practice, for all the scary times he made the boogey man go away, let him know that you appreciate that he was and always will be your anchor. Give Dad a gift that he will always treasure. Add the Lucky Feather Best Dad EverAnchor tie pin to your cart today! COMMEMORATE Father's Day (or any day you want to make your dad feel special) with Lucky Feather's Anchor Tie Pin. MESSAGE on display card reads: "You're my Anchor" and the title "BEST DAD EVER"! GROUNDED is what you are, because you have him for a dad. You're a lucky kid! VERSATILE because the "tie pin" isn't just for ties. It can be worn on a tie, a lapel, a cap, anywhere dad wants. NICKEL-FREE design is gentle and non-reactive to sensitive skin and ties!